Even if you are not a football fan it was impossible to ignore FC Barcelona’s miraculous comeback against Paris Saint-Germain in the round of 16 of the UEFA Champions League. Players, managers, and athletes worldwide joined the party on social media and reacted to this nail-bitting last-minute win. The German car brand has been a long-time partner of the club and have celebrated together many victories. They produced an inspiring video to celebrate the comeback. 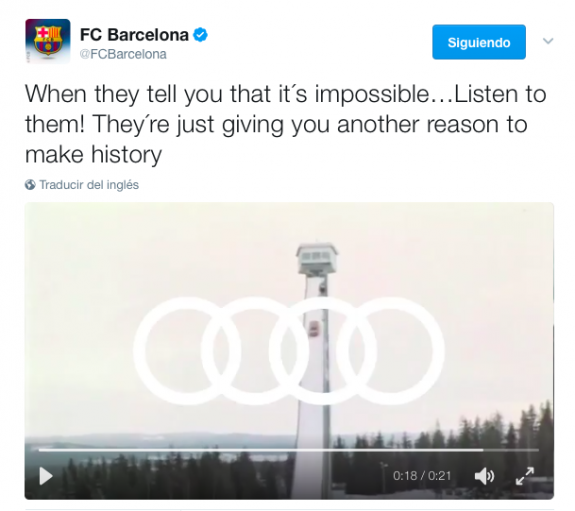 The video was shared through the club’s official Twitter account. The day after the match Gatorade shared their commercial entitled It’s Never Too Late To Change The Game. Ironically, the commercial features Leo Messi scoring an important goal in the last minutes of the match. The ad also features other prominent football stars such as Thierry Henry and Alexis Sanchez. 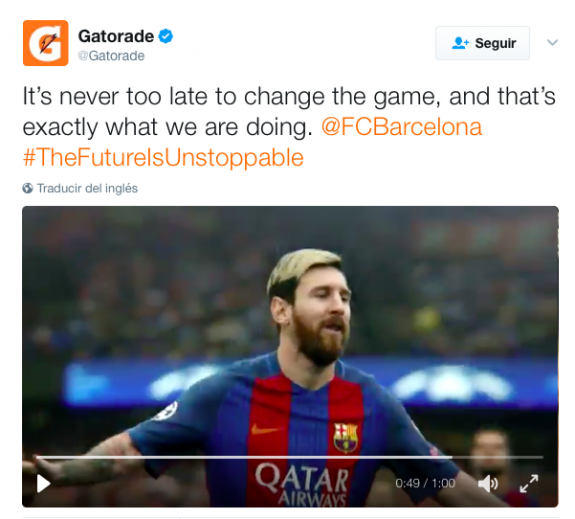 The video was shared on the twitter accounts of both FC Barcelona and Gatorade. As part of the PepsiCo group, Gatorade is the official sports drink of the UEFA Champions League. Gatorade also has existing partnership agreements with top clubs such as FC Barcelona, Arsenal and Juventus. The Turkish home appliance manufacturer celebrated the win by interacting with its followers on Facebook and Twitter. 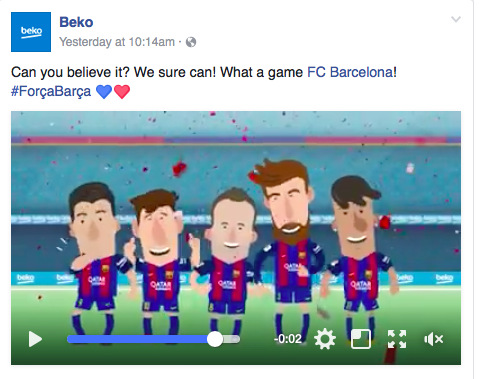 In 2014 Beko signed a four-year global sponsorship agreement with FC Barcelona. As part of the agreement the brand’s logo appears on the sleeve of the FC Barcelona shirt. 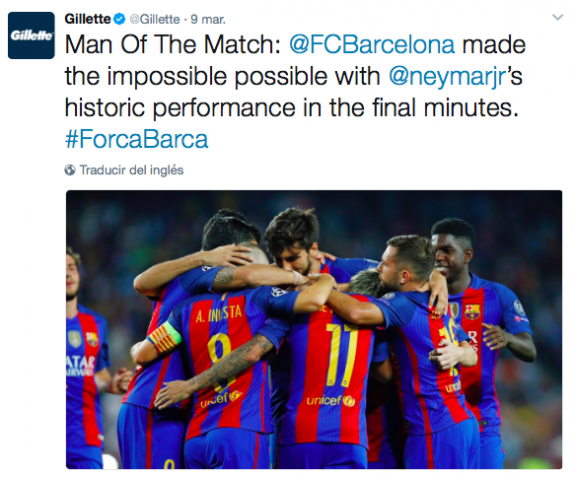 Gillette took to Twitter to celebrate the win by awarding a “Man of the Match” performance to Neymar, who also has a personal endorsement deal with the American brand. The shaving and personal care brand signed a sponsorship agreement with FC Barcelona in 2016, becoming a Premium Partner for the club that runs until 2019. 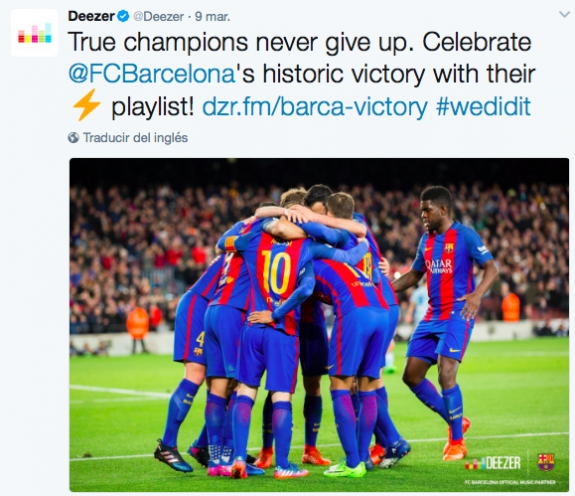 In 2016 FC Barcelona and Deezer signed an agreement to become FC Barcelona’s official music streaming partner. The music streaming site offers its users official playlists of both the club and its first team footballers and other athletes. After the match they shared the following tweet congratulating the club on the fantastic comeback. 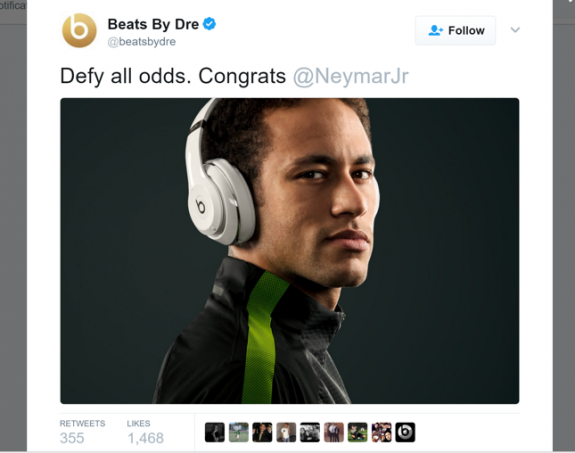 The audio product company acknowledged their iconic brand ambassador, Neymar, by congratulating him via the company’s Twitter, Facebook, and Instagram accounts. 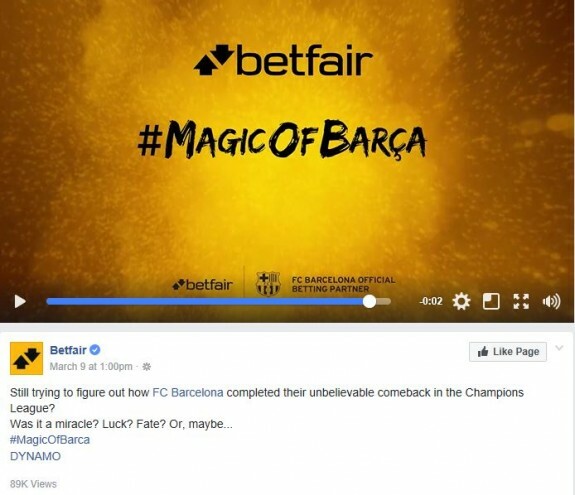 FC Barcelona’s betting partner also created a reactive trailer to help build anticipation to the match featuring English magician, Dynamo, which formed part of their overall #MagicOfBarça campaign. Epic matches such as this one provide sponsors a unique opportunity to connect with their consumers worldwide, with football as the main vehicle to drive the desired conversations about their own brands. Success stories of determination and resilience such as this one demonstrate how powerful sports can be in the art of storytelling. That said, it is important that the messages conveyed by the brands are authentic and consistent so as to not be deemed opportunistic or distasteful. This article was written by the Marketing Team at the Sports Business institute Barcelona. Research was conducted by David Haimovich, Marketing Assistant at the Sports Business Institute Barcelona. If you have any comments or questions about this post feel free to contact him at david.haimovich@sbibarcelona.com. You can also follow him on Twitter at: @HaimovichDavid.